Retired Chief Dave Campbell 73-79, has found two patches worn by the Black Knights of our Helicopter Crews HC-1 Det 6 (Call Sign = Blackbeard 1). Dave was a BM2 back then and was the Landing Signalman (LSE) for Flight Operations. He is donating one of the patches to the USS Oklahoma City Association for use in their extensive library of OKC memorabelia which can be seen at the reunions. ^^^ Will retire in Mar 01 - bunked in CR Div. Looking for OK City name tag emblem/logo for my shadow box if anyone has a spare. ^^^ I spent 21 yrs til retirement in 92 aboard USS Arthue W Radford, after last Desert Storm cruise. Married the woman I met while on CG5. We have 2 daughters in the military, 1 in USAF, stationed in Yakota, JP + 1 in USMC,who just returned from her 2nd 10-mo tour in 2 yrs. I work at a Golf & Yacht Club as head mechanic for past 21 years. *** CRA- Combat Rescue Airman, Helicopter Combat Support, Squadron 7 (HC-7), DET 101 - I was the Admirals aircrewman flying in a UH2 Seasprite. We steamed from Danang to Korea after the EC-121 shootdown. 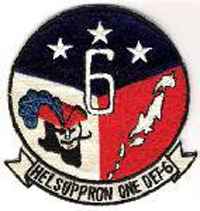 *** AECS - was 1st det cpo and only designated aircrewman for blackbeard one for first 8 1/2 months of our existence. Was quite a hassle forming the det. Being the only airdale chief on the OKC, I was given quiet a time by my fellow chiefs in the mess. I donated the HC1 det 6 plaque and possibly the patch that is being offered. ^^^ Retired after 31 years. Single Dad raising two boys. Former BM and PN. Got commission thru old NavCad Program.